Actual episode writer was unavailable for the commentary, due to work commitments in New York. A representative of the Environmental Media Awards suggested entering this episode for the 2003 ceremony. It secured a nomination but not a win. The Educational Film None Like it Hot! is inspired by old Bell Lab videos. David's Dad often asked for him to do a global warming episode. 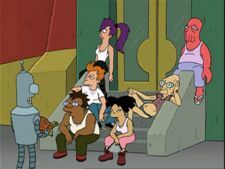 One of the shortest first acts in Futurama history. Matt requested that there be a reaction to the president calling them. Halley's Comet is brown due to the removal of all the ice. Discussed the correct pronunciation of "Halley"
Design of the space suits compared to the ones used at Luna Park. There are a lot of jokes in Futurama in which someone makes a statement about a grave danger, followed immediately by a joke about it, followed by the end of an act. Usually, Bender is responsible. Maurice read Al Gore's character at the table reading, with Kristin Gore in the room. During Gore's presidential campaign he called the Futurama offices to talk to his daughter Kristin but somehow ended up on the line with a room full of writers. The mirror's beam was originally going to destroy an ant planet. Needed a personal connection to the staff despite being a global issue. To produce the C-3PO-like voice, Billy West talked into a tea cup. The Sport-Utility Robot resembles early designs for Bender, especially the ears. The joke about classifying the Sport-Utility Robot as a light truck was briefly cut from the episode. At an anti-war protest Matt attended, there was a sign saying "Draft SUV drivers first". Bigger SUVs and guns are being released. Billy's imitations, instead of trying to be dead on, plays up the flaws and quirks in the voice. The episode has turtles and the Galapagos Islands, but the two are unrelated. Agnew was Eric Kaplan's idea. They are aware his ability to make sound is odd. Hedonism Bot was created for the line "let the games begin" and his role in the episode grew backwards from there. Bender has fallen down before, but all those times he was slightly on his side. The burping in the crowd scene was to be done by members of a group brought in to do extra background noise, but only one woman could burp on command, she had to do so repeatedly to produce the sound. Ending is similar to "A Big Piece of Garbage", the solution isn't permanent and the professor receives a prize. This would most likely give the Earth a more elliptical orbit. Ken Keeler: ...No, I don't remember. David: Ken, you wrote it. Unknown: But would you please remember? Maurice (Narrator): You wrote it, you can't un-write it! David says that Hermes and Farnsworth are sitting around he office naked, but Hermes is clearly wearing a speedo. This page was last edited on 27 September 2011, at 17:06.